The origins of this Chicken Tetrazzini recipe remain unclear to me dspite my research. Some say it is Italian while others proppose it's firmly an American recipe. But wherever it comes from, it's truly delicious! Find a frying pan and heat about half of the butter untill it melts. Slic the onions and gently saute untill they turn a nice golden colour. Set to one side. Melt the other half of the butter in a saucepan and then add the flour, a pinch of salt and a some pepper. Stir thoroughly untill the sauce starts to get thick. Throw in the chicken, sherry, and mushrooms. Having already cooked the noodles, put them in a casserole dish and then pour the sauce on top. Sprinkle with some paprika and the cheese and put in a preheated oven at 225 C (425 F), for about 20 minutes. 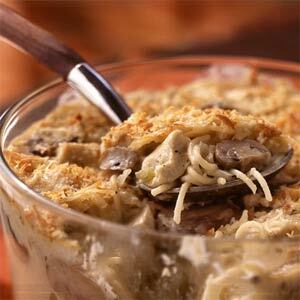 Serve your freshly cooked Chicken Tetrazzini piping hot with a sprinkle of fresh Basil. Lovely!